A BBC space oddessey in 14 episodes. Radio's answer to Dan Dare! Orbiter X was broadcast from 28 September - 28 December 1959 and starred John Carson, Andrew Crawford, Barrie Gosney, Donald Bisset, John Witty amongst several others. Written by B[ertie] D. Chapman and produced by Charles Maxwell. 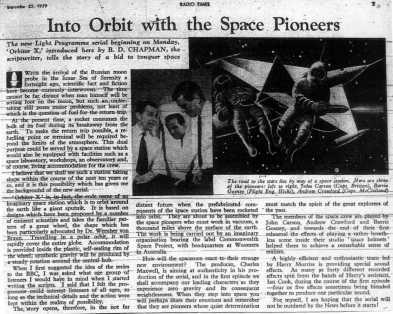 The new Light Programme serial beginning on Monday, 'Orbiter X', introduced here by B. D. CHAPMAN, the scriptwriter, tells the story of a bid to conquer space. With the arrival of the Russian moon probe in the lunar Sea of Serenity a fortnight ago, scientific fact and fiction have become curiously interwoven. The time cannot be far distant when man himself will be setting foot on the moon, but such an undertaking still poses major problems, not least of which is the question of fuel for the return trip. At the present time, a rocket consumes the bulk of its fuel during its breakaway from the earth. To make the return trip possible, a refueling point or terminal will be required beyond the limits of the atmosphere. This dual purpose could be served by a space station which would also be equipped with facilities such as a space laboratory, workshops, an observatory and, of course, living accommodation for the crew. I believe that we shall see such a station taking shape within the course of the next ten years or so, and it is this possibility which has given me the background of the new serial. 'Orbiter X' is, in fact, the code name of an imaginary space station which is to orbit around the earth like a giant sputnik. It is based on designs which have been proposed by a number of eminent scientists and takes the familiar pattern of a giant wheel, the shape which has been particularly advocated by Dr. Wernher von Braun. Travelling in a polar orbit, it will rapidly cover the entire globe. Accommodation is provided inside the plastic, self-sealing rim of the wheel; synthetic gravity will be produced by a steady rotation around the central hub. When I first suggested the idea of the series to the BBC, I was asked what age group of listeners I would have in mind when I started writing the scripts. I said that I felt the programme could interest listeners of all ages, so long as the technical details and the action were kept within the realms of possibility. 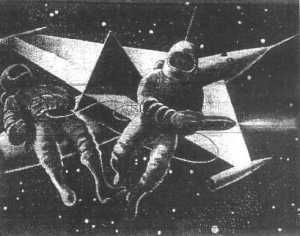 The story opens, therefore, in the not far distant future when the prefabricated components of the space station have been rocketed into orbit. They are about to be assembled by the space pioneers who must work in vacuum, a thousand miles above the surface of the earth. The work is being carried out by an imaginary organisation bearing the label Commonwealth Space Project, with headquarters at Woomera in Australia. How will the spacemen react to their strange new environment? The producer, Charles Maxwell, is aiming at authenticity in his production of the serial, and in the first episode we shall accompany our leading characters as they experience zero gravity and its consequent weightlessness. When they step into space you will perhaps share their emotions and remember that they are pioneers whose quiet determination must match the spirit of the great explorers of the past. 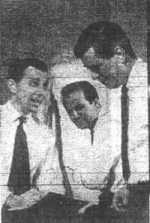 The members of the space crew are played by John Carson, Andrew Crawford and Barrie Gosney, and towards the end of their first rehearsal the effects of playing a rather breathless scene inside their studio 'space helmets' helped them to achieve a remarkable sense of realism. A highly efficient and enthusiastic team led by Harry Morriss is providing special sound effects. As many as forty different recorded effects spin from the hands of Harry's assistant, Ian Cook, during the course of the first episode - four of five effects sometimes being blended together to produce one particular sound. For myself, I am hoping that the serial will not be outdated by the News before it starts!